Job Description: Assisting a Certified Crop Adviser in weekly field monitoring. Responsibilities include: identifying field production problems related to weeds, diseases, and insects as well as assisting in GPS soil sampling and data entry. 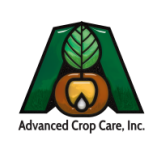 Advanced Crop Care Inc. is dedicated to providing its interns with a valuable learning experience, which will increase their knowledge in crop management. Positions allow for the wide diversification of crop consulting within a growing season.